I know, I haven’t posted any roti recipes so far in this A-Z lunchbox series. But no worries, starting today a couple of my upcoming recipes are with roti. 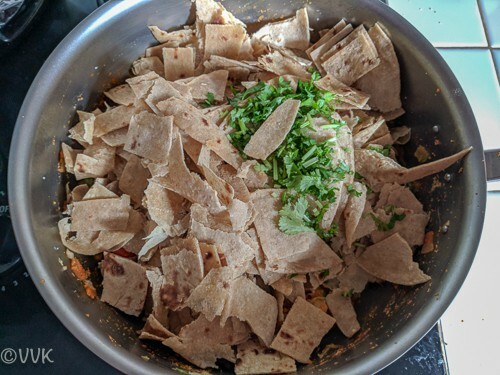 Kiddo likes to take roti and curry or paneer, but some days when he is not in a mood for roti and curry, I make this veg kothu chapati which he likes a lot. 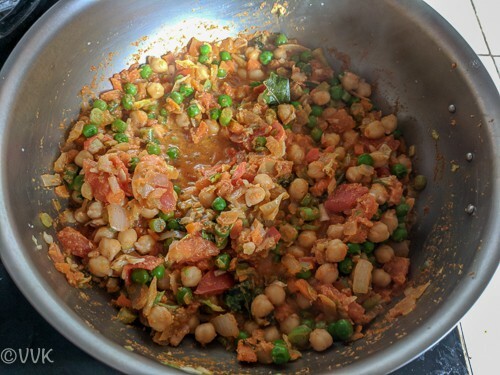 I add veggies as well as garbanzo beans, so this veg kothu chapati makes a decent balanced meal. I have posted veg kothu porotta recipe as well, but for that, I used my leftover veg salna. But for this recipe, I went with fresh ground masala. But you can use leftover salna or leftover kuruma also. 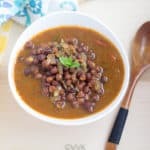 Including garbanzo beans is optional, but as we got used to that garbanzo beans in Saravana Bhavan kothu porotta, I always add on mine as well. The ingredient list might be lengthy, but it is effortless and easy to make. 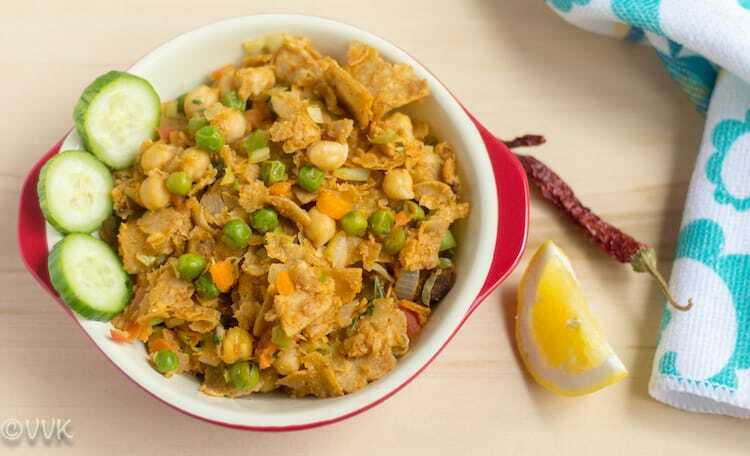 After you try this recipe, I am sure you will make roti just for making this veg kothu chapati. 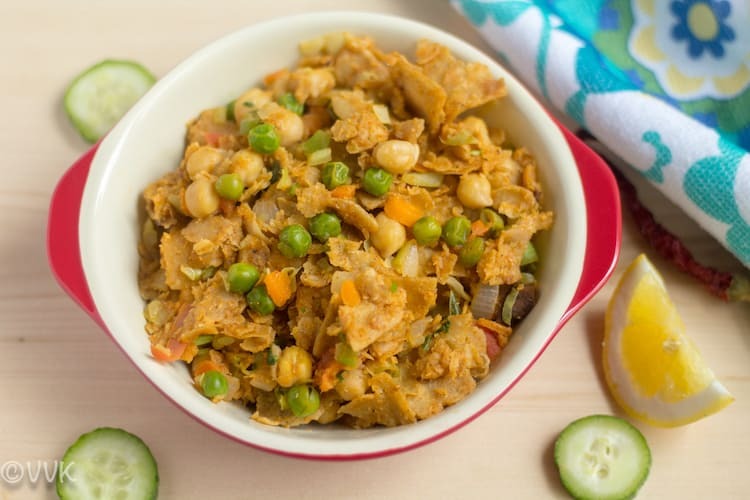 :-) We love the flavor of the chapati pieces soaked in the masala. The more it soaks in the masala, better it tastes. So it’s a perfect recipe for the lunch box. Roughly cut the chapati into small pieces. 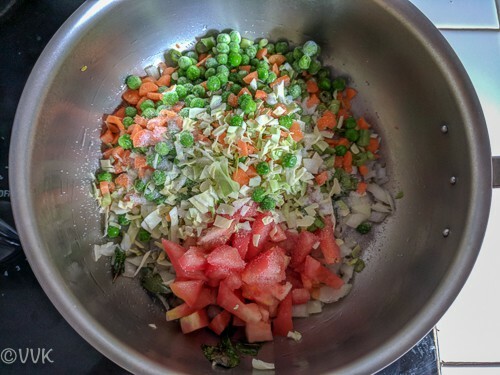 Chop all the veggies including tomato and onion and set aside. If using frozen peas and coconut, thaw them and make sure they are in the room temperature. 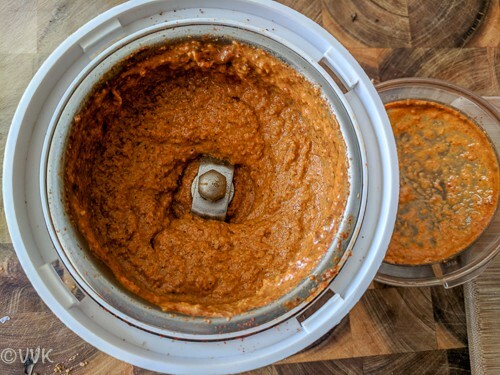 Grind the coconut, red chili powder, ginger garlic paste, kalpaasi, and garam masala by adding ¼ cup of water into a smooth paste. Soak the garbanzo beans for at least 5 hours and pressure cook it for two whistles. Or if using canned beans, rinse the beans and set aside ¼ cup. Heat a wide and a thick bottomed pan or kadai and add oil. When the oil is hot, add the fennel seeds, onion. 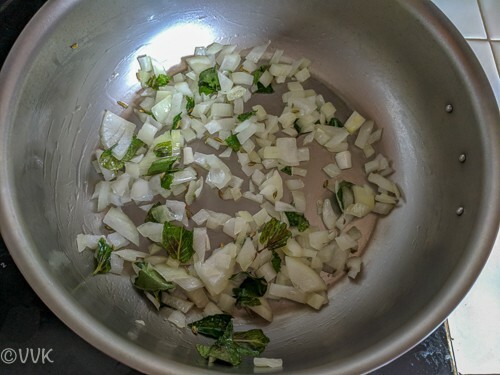 Break the curry leaves and mint leaves and add it along with the onion. Sauté the onion until they turn translucent. Now add all the veggies including the tomato. Add salt and mix. Cover and cook these for 5 minutes or until the vegetables are soft and tender. Remove the lid and let it cook for a couple of minutes. 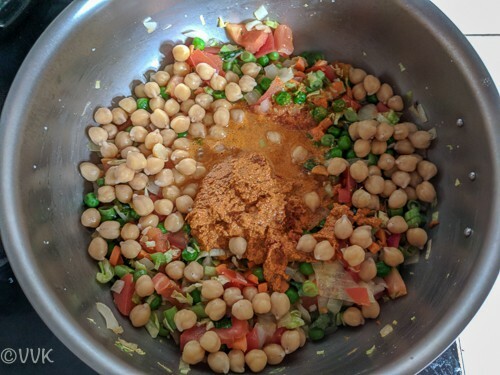 Now add the cooked garbanzo beans and ground masala. Add the remaining ¼ cup of water. Let this mixture simmer for two to three minutes over medium heat. Now add the chopped chapati and cilantro. Gently mix them and let it cook for five minutes. That’s it. Veg kothu chapati is ready. 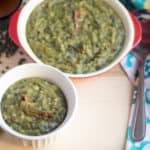 Serve it with onion raita or ketchup. If you add salt to your chapati, then add less salt while making this recipe. I did not add salt to my chapati this time, hence went with 1.5 tsps. Adjust the veggies and their quantity as per your preference. As I mentioned garbanzo beans are optional, but you can always replace them with other beans of your choice. I prefer grinding the spice powders along with coconut as it blends well. 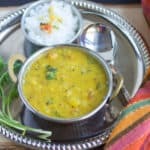 Instead of fresh coconut masala, you can use leftover kuruma or salna. As always, adjust the salt and spice as per your preference. Remove the lid and let it cook for a couple of minutes. Now add the cooked garbanzo beans and ground masala. Add the remaining ¼ cup of water. Let this mixture simmer for two to three minutes over medium heat. Now add the chopped chapati and cilantro. Gently mix them and let it cook for five minutes. Adjust the veggies and their quantity as per your preference. As I mentioned garbanzo beans are optional, but you can always replace them with other beans of your choice. That ground masala sounds yumm vidhya! Love the delicious makeover to the humble chapathi!!! Nice way to jazz up leftover roti!!! I make another version of this but never packed it for the kids lunch box. Adding that paste must have made it double yum.Bookmarking to try. Thanks. Have you posted yours? I have never tried chapathi fry adding spices and veggies. Good one to try with leftover rotis. This is such a filling dish when packed for lunch. 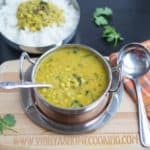 Great idea to use the leftover chapathi from dinner to make this and best part is the dish remains soft and nice until lunch. What a fantastic choice for V Srividhya, I love this with the parotta. Though I do make it sometimes, I never packed it for lunch. Should try it out sometime, wonder if the chapati stays good and not turn very soggy or mixed up. 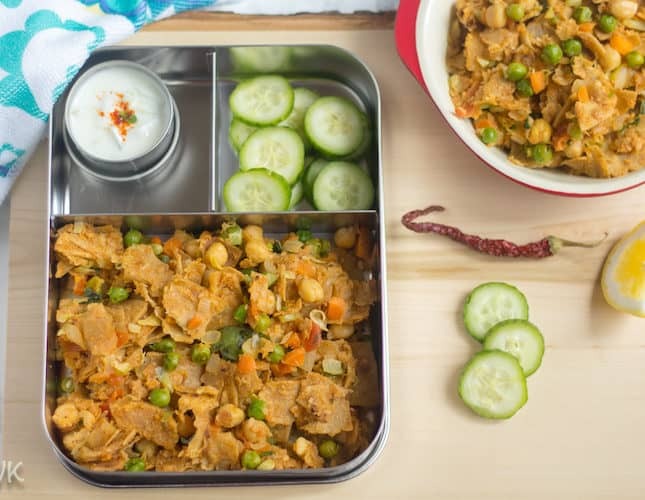 These are such a treat in lunchbox , kothu chapathi looks so tempting vidhya , your version with garbanzo beans and that kalpaasi pd added is something very interesting !! 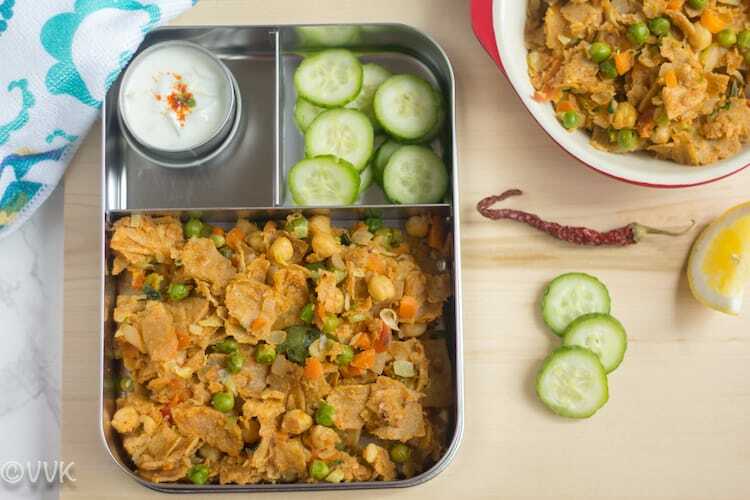 Wonderful lunch box dish even an adult would enjoy it .. Semma !! The veg kothu looks really flavorful and inviting with the ground masala and spices. I once made chatapati roti fry and loved it, this looks more interesting and perfect for lunchbox. Wow the veg kith chapati looks so delicious. I have a leftover roti recipe where its cooked in buttermilk. This one looks so tempting that I’m going to try it. 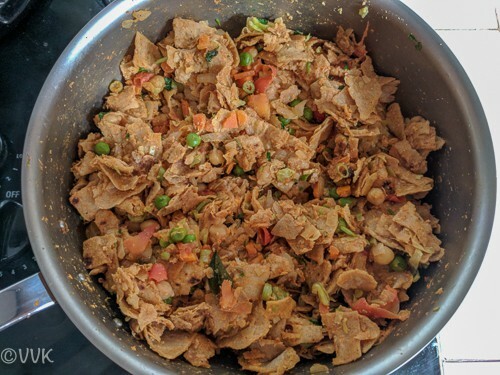 I am a great fan of kothu parotta and so I know I would love this kothu chapathi too. Your vaandu is so lucky to get these many varieties in his lunch box..
he he.. at times I send the boring ones too. Thanks Gayathri. That sure is a great way to use up leftover roti. It looks so colorful and sounds flavorful with that ground masala paste. Do you make it in the morning or make it at night when packing for lunch? I sometimes do it in the night itself Pavani. If I have leftover Kuruma, I use that instead. 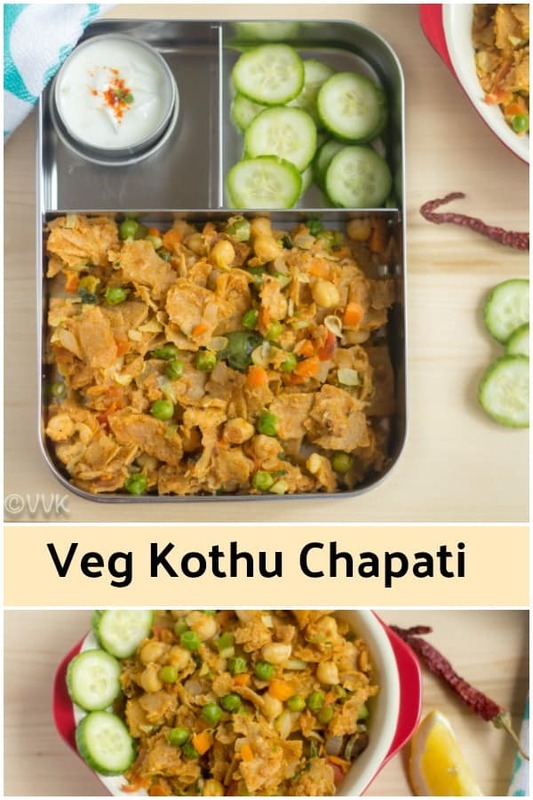 Looks absolutely yumm… I will never say no to kothu chapathi with some raita .Can happily have this for all the 3 meals!! My favorite way to finish off the left over chapathi. Like the spices get into that grounded masala and really love the kalpasi, it gives amazing flavor to any dish. Good choice for lunch box. Very true about kalpasi. Thanks, da. 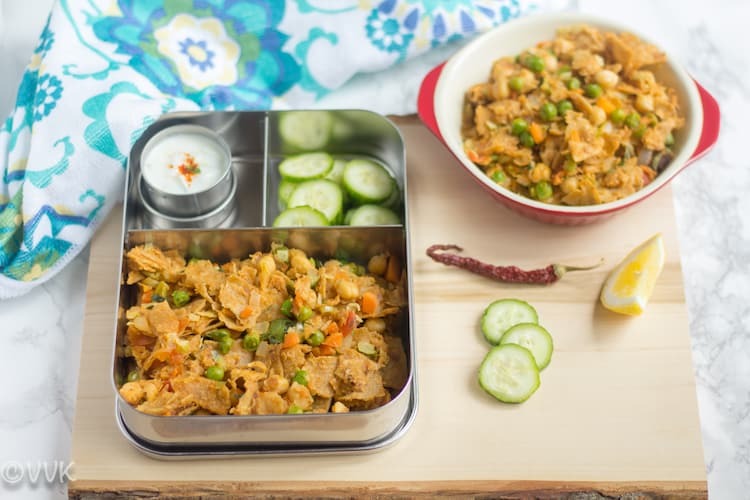 If you pack me this kothu chappati, i can carry my lunch box every daily without any fuss. I just love these sort of dishes very much. Drooling here. he he he I can hear ya… same here. Thanks Priya. That’s a neat dish. I didn’t know about the addition of coconut, good pick. We have a Sindhi version and a Gujju version of using the leftover chapatis and I love both the versions . 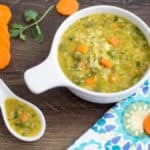 This version has loads of veggies unlike the other two , which makes it so healthy too . Now this is on my to do list , I am sure I will love it . Great for a lunch as well . wow didn’t know about those two versions. Let me dig your blog. 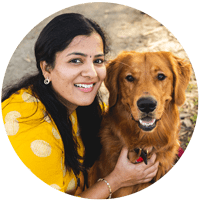 Thanks, Vaishali. What a superb idea of using leftover chapatis. I am definitely going to try this for my family. The blend of coconut masala makes a ton of difference, I guess.